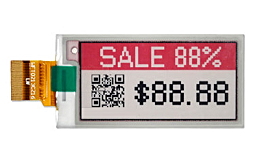 E-paper displays are based on thin film transistor three-pigment matrix, black, white, and red E-Ink display panels. 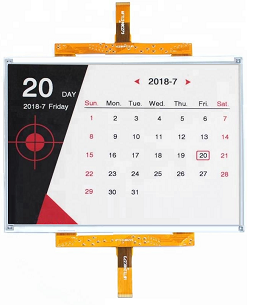 This technology provides a bright natural light-readable display which, thanks to the bi-stable nature, requires very low power to refresh the screen and no power to maintain the image. 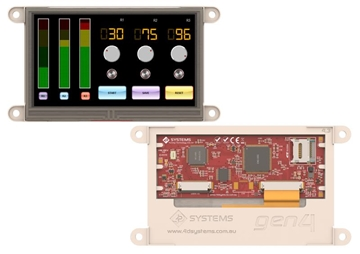 The small size modules can operate on small battery for long periods of time. 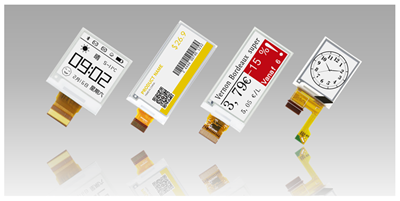 Typical applications include electronic shelf labels, signage, automation, navigation systems and other digital emerging internet applications. 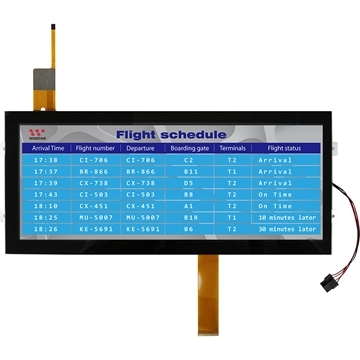 NV200200E154#D0* E-paper display with SPI interface and reference system design. 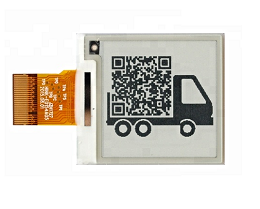 Size 1.54'', outline 31.8x36.32x1.05mm, resolution 200×200pixels and 1-bit full display capabilities. 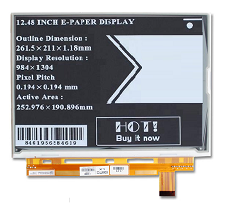 NV212104E213#D0* E-paper display with SPI interface and reference system design. Size 2.13”, outline 29.2x59.2x0.98mm, resolution 212×104pixels and 1-bit full display capabilities. 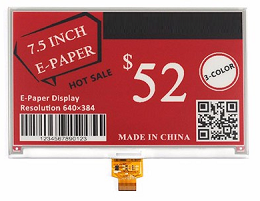 NV264176E270#D00 E-paper display with SPI interface and reference system design. 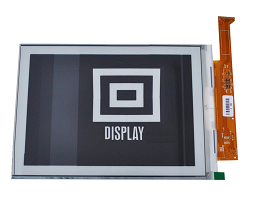 Size 2.7'', Ouline 70.42x45.8x0.98mm, resolution 264×176pixels and 1-bit full display capabilities. 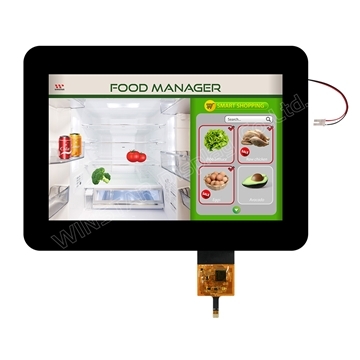 NV296128E290#D02 E-paper display with SPI interface and reference system design. 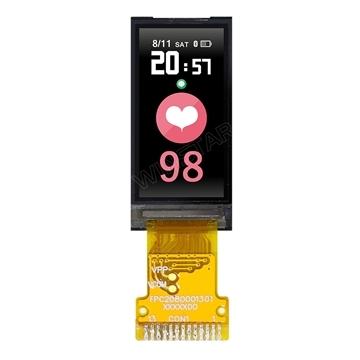 Size 2.9”, outline 79x36.7x1.18mm, resolution 296x128pixels and 1-bit full display capabilities. 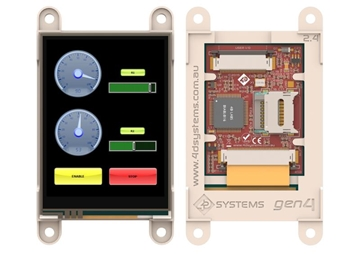 NV400300E420#D0* E-paper display with SPI interface and reference system design. Size 4.2”, outline 91x77x1.18mm, resolution 400x300pixels and 1-bit full display capabilities. 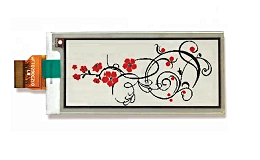 NV600488E583#D0* E-paper display with SPI interface and reference system design. Size 5.83”, outline 125.4x99.5x1.18mm, resolution 600x488pixels and 1-bit full display capabilities. 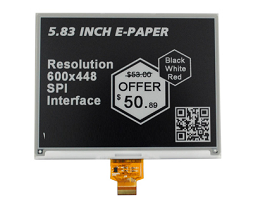 NV640384E750#D01 E-paper display with SPI interface and reference system design. Size 7.5”, outline 170.2x111.2x1.18mm, resolution 640x384pixels and 3-bit full display capabilities. 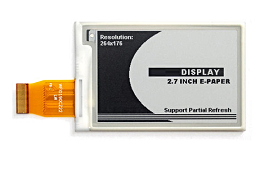 NV7681024E800#D00 E-paper display with parallel interface and reference system design. Size 8”, outline 134.11x167.62x1.18mm, resolution 1024x768 pixels and 1/4-bit full display capabilities. 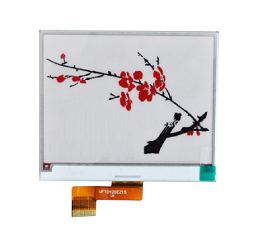 NV1200825E970#D00 E-paper display with parallel interface and reference system design. Size 9.7”, outline 218.8x156.42x1.15mm, resolution 1200x825 pixels and 1/4-bit full display capabilities. 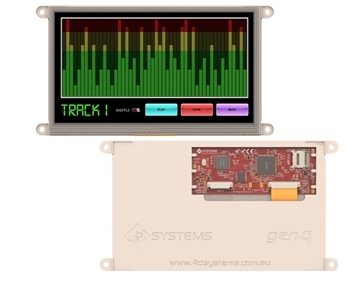 NV9841304E1248#D0* E-paper display with SPI interface and reference system design. Size 12.48”, outline 261.5x211x1.18mm, resolution 1304x984 pixels and 1-bit full display capabilities.